Don’t have a shower? No problem. The shower solutions is a no rinse required bathing wipe that is extra-large and extra thick! Premium formulations created the shower solution to help people who have difficulty bathing due to injury or illness or any outdoor activities. The shower solutions added 2 extra-large wipes per pack compared to leading national brands. 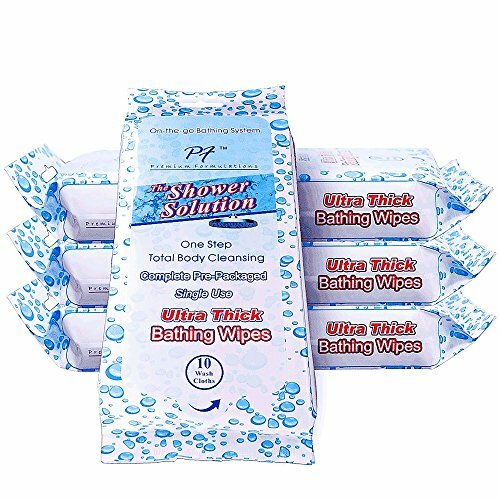 This orders comes with 4 packs of 10 premium washcloths to clean the entire body. There is no sticky residue. Just unfold the wet cloth, smooth and wipe the towelette over anywhere that needs freshened. The shower solutions also warms easily in a microwave or warmer for increased comfort. No water or rinsing needed. Safe, simple, no need for advanced preparation. Ideal for institutional care such as nursing care, day care, and anywhere where assisted or non-assisted rinse free bathing is required. If you have any questions about this product by Premium Formulations, contact us by completing and submitting the form below. If you are looking for a specif part number, please include it with your message.